Title Tags- sometimes called “Page Titles” or “Browser Bar Titles” appear in the head of every web page. They populate the upper chrome area of the browser bar and are considered to be the single most influential on-page SEO ranking factor. Understanding the relationship between the quality, uniqueness and relevance of the Page Title and applying that knowledge, sets you up to rank well for your keywords . Optimising Browser Page Titles correctly to accurately reflect the content of the page, is one of the primary tasks of on-page optimisation. 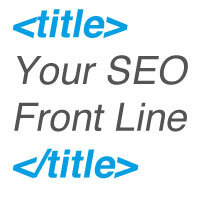 When we provide seo services, the first on-page element we check is the title tag. How its been written- and how it relates to the rest of the content on that page, tells us a lot about the quality of any prior SEO and how we would expect the page to rank before we consider other factors. In WordPress, the SEO plug-in “Yoast” refers to the page title as the “SEO title”. Within a Joomla site, the Page Title is edited within a menu item under “Browser Title”. Magento uses “Page Title” within the edit window. 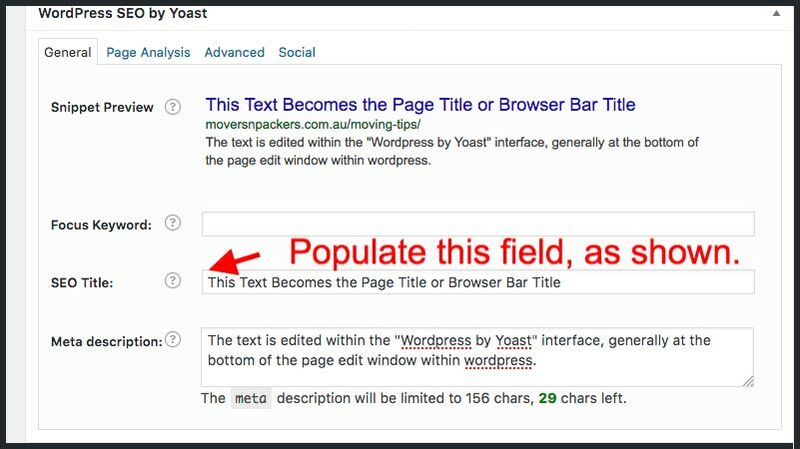 The following images show the location of the Page Title within a WordPress installation running Yoast. You should also uncheck the “Force Rewrite” checkbox which is found under “SEO” in the left sidebar of the admin interface. Hover your mouse over “SEO” and select “Titles and Metas” from the fly out, to edit this property. When you write a page title, it might work best if you write your page content first- then write a title which really fits with what you’ve produced. If the title is not what you had in mind- then it’s best to rewrite the content until everything flows as a seamless piece. If you can write a title first and diligently stick to the topic- then power to you! However you do it, ensure that your page title is an accurate reflection of the contents of that particular url. Think of your Page Title as an advertisement for your page. Your meta description is the copy for that ad. Follow these guidelines of high-ranking pages. There will always be pages which break the rules and rank highly- remember it’s possible to get a ranking boost using a number of different techniques and each SEO company has their own preferences. Ensure your title is unique. Do not ever copy a title from another page on your website or from another domain. Around 60 characters is a good length- don’t panic if the entire title is not visible in the blue link in search result. Use descriptive text, as well as your primary keyword early in the title. Use a pipe to separate short, sharp related phrases. Longer phrases can be separated with commas. Be judicial with keyword use- the more you use, the lower your relevance score on that page, for each keyword. Synonyms work well- select them carefully. Use natural language- something you could comfortably read out loud to an audience. Be absolutely certain that your title accurately promises what the user should expect on the page. Minimise the use of stop words- see this list of stop word examples for more information. In the image below, you can see three colors of shading. The page title tag is shown in orange shading. Green shading highlights the description sometimes called the seo snippet which often appears beneath the title within organic search results. 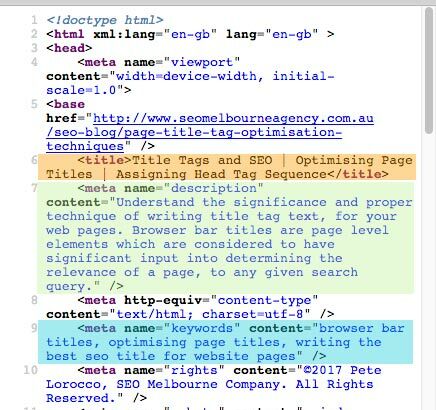 The blue tint shows the meta tag output code which is responsible for bringing the keywords into the head area of the page, from the keyword field of the CMS. 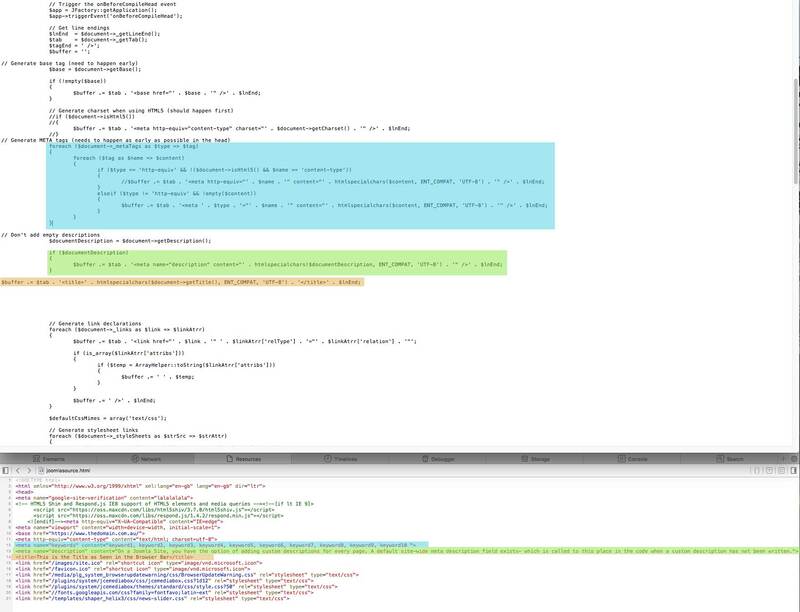 The image is also divided into two views, showing the php file which outputs the html, and how the html code appears when you view the page source in your web browser. The following image shows the elements appearing in the most seo-friendly sequence possible. If you’re unsure of how to arrange the code within the php file so your output matches the sequence we’ve shown here, get some professional advice or assign the task to us, and we’ll get it done for you. Be careful editing core php files! One wrong space or comma can break a website! if you need to edit a Joomla, WordPress or magento php file which relates to head code, it’s likely the changes you make will be required every time you update WordPress, Joomla or Magento. Always back your site up, prior to making any significant changes. A good, SEO friendly CMS will enable you to manage important elements separately for every page, and not append or prepend any text to your custom input. Be particularly careful of custom web builder content management systems, which are often designed to make the construction of websites easy for novices. These platforms often have handicaps built in, as their market is the webmaster who is beginning their journey into site development. Follow our SEO guidelines for writing the best page titles. The suggestions here are representative of the techniques we use as part of a balanced on-page optimisation project. When used and implemented correctly they will yield positive ranking gains.